Let’s get right to the point. Over the last 18 years, which has been the worst drought in history on the Colorado River, the amount of water in Lake Powell has declined from 20.99 million acre feet in the year 2000, down to 12.38 million acre feet in the year 2018[i]. That’s an average of 477,973 acre feet per year, which is 155 billion gallons of water per year. All the “powers-that-be” – the states, federal government, various water agencies, and some conservation groups – are proposing a “Drought Contingency Plan” to try and save Lake Powell by buying water from farmers in Colorado, Wyoming, and Utah, using taxpayers’ money, to send that water down to Lake Powell. If you think this “worst drought in history” is a temporary drought, and that it’s going to start raining and snowing again – year after year after year – like it did before the year 2000, then maybe the powers-that-be are right. However, if you believe in climate change and the predictions by every climate change scientist working in the Colorado River basin – including in the “Fourth National Climate Assessment” that came out last week (read Chapter 25[ii] about “water” in the “Southwest”) – then the powers-that-be are wrong. These scientists predict that the flow of water in the Colorado River will not increase, and will not stay the same, but in fact will decrease even more over time due to climate change. Our organization believes in climate change and the predictions of the best scientists, and therefore we believe the powers-that-be are wrong, dead wrong. Further, they are proposing to drain and destroy hundreds of thousands of acres of farms using billions of dollars of taxpayer money to try and save Lake Powell in opposition to scientific reality as well as political and financial common sense. Simple back-of-the-envelope math tells you that if you try to save Lake Powell, you’ll have to buy a minimum of 477,973 acre feet of water per year just to stabilize the lake level where it’s at right now. Doing so won’t increase the lake level, and further won’t address any future decrease in the lake level due to the increasing impacts of climate change which will further decrease the flow of water in the Colorado River. We are not the only people to raise this extremely serious concern. To be clear and fair, all three of these powerful officials publicly and loudly support the Drought Contingency Plan, but the fact that we see strong and serious reservations from such high-ranking officials points to the skepticism and questionable likelihood of the Plan’s success. What’s also true is that water ain’t cheap. Over the past 4 years, the states and federal government have tried to temporarily rent water from farmers in a “pilot program” to see if this Drought Contingency Plan would work. So far, they’ve spent $4.5 million renting 22,000 acre feet of water, which comes out to $204.54/acre foot[vi]. If you tried to rent 477,983 acre feet of water, you’d need $97.8 million, and you’d need to do it every year, at a minimum, to stabilize Lake Powell. Further, you’d need to find thousands of farmers willing to dry up hundreds of thousands of acres of farms – every single year, forever – to make this Drought Contingency Plan work. You know what else? On the Front Range of Colorado, the purchase price of water hit $21,600 per acre foot for Colorado River water out of the Colorado-Big Thompson project in 2018, an all-time high[vii]. And, that water price has doubled over the exact same time period of this historic drought, 2000 – 2018. If your end-game plan was to rent Colorado River water to save Lake Powell, the cost would escalate every year. And if all of that isn’t convincing enough, the Upper Basin States — Colorado, Utah, and Wyoming — are proposing even more new dam/diversion projects to take even more water out of the Upper Colorado River. 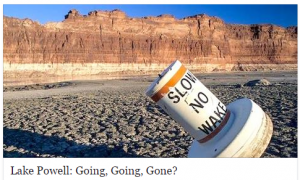 These projects could be over 300,000 acre feet of new diversions per year[viii], and thus would require that much more water to be bought from farmers every single year to just try and stabilize the level of Lake Powell. Our organization does not believe there’s enough money, enough farmers, and enough water to save Lake Powell. It’s time to develop “Plan B”, which is abandoning Lake Powell and supporting climate science and common sense. Gary Wockner, PhD, directs the Save The Colorado River Campaign, Contact: Gary@SaveTheColorado.org. Colorado River Update: Is MEAT killing the Colorado River? Big News Week for the Colorado River!